We love good food from the French Fine Dining Places to Hole-in-the-Wall restaurants. Our recent quest led us to Makati’s secret place for Bicol comfort food. Top Meal Food Haus specializes on Bicol favorites like the Pork Binagoongan and Bicol Express. It is also popular for its Pancit selection which includes Pancit Lucban with Chili. If you like Som’s Thai restaurant in Makati, check out Top Meals Food House within its Makati neighborhood (at the back of Rockwell). There are 5 small tables inside and 2 small tables outside that can sit 2-3 people. You would see native artworks from Sorsogon around the resto and a single ceiling fan to cool the surroundings. Allegedly, this place is a favorite hang-out of Atenistas, Rockwell people and foodies. What I like about Top House is that it is not like a carinderia where the food is prepared in the morning and served all day. Most of the dishes are cooked when you order it so that it is served hot and fresh from the kitchen. It is best if Wilson Tan is in the resto because he will be the one to cook for you. 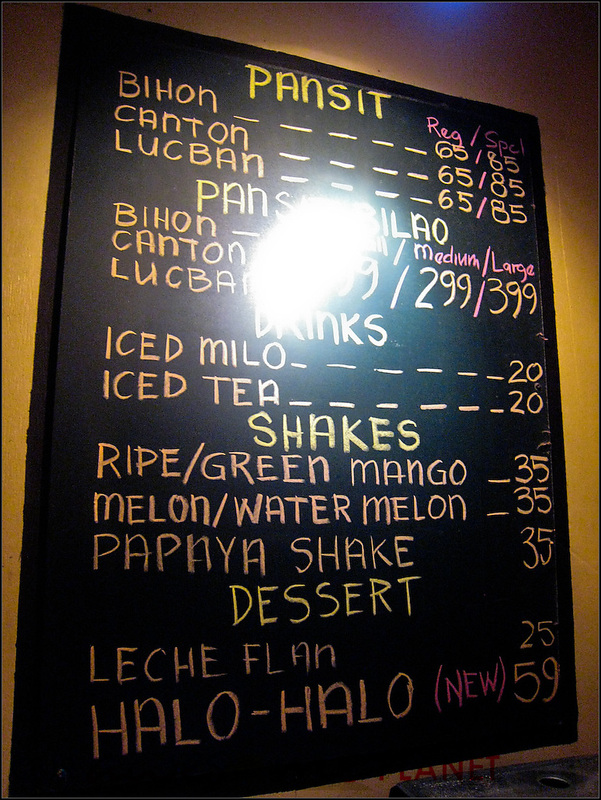 Ripe Mango Shake (P35) and Iced Milo (P20). We tried out the cool drinks and it tasted like it was over diluted with water. For less than P40, you should lower your expectations on these drinks. Wilson’s specialty is the Pork Binangoongan which is prepared with toasted alamang. The Bicol Express is made with gata and a good mix of fatty and lean meat pork. You can specify if you want your food to be really (chili) hot like how they enjoy it in Bicol. The serving plates are small (in proportion with the small tables) but its flavor is enough to compensate for its size. We ordered vegetables to go with the pork bicol specialties. It was a bit dry. The Halo-Halo was a bit different because it had a slimy texture because of the Ube made with gata. In Tiwi Halo-Halo tradition, it was served with cheese sprinkled on top. The Leche Plan tasted like it was sugar free. This one is a matter of preference — I like it because it has its own character, while my wife hates it because it was slimy. Wilson Tan, a computer graduate turned into chef entreprenuer. You can contact him at +632 895 1249, or +63915-391 4571. 5994 J.D. Villena St. cor. Mabini St. Poblacion, Makati. The place is beside Estelle Salon. Text and Photos (Using a Canon Point & Shoot Camera) by Anton Diaz. Copyright 2008. P.S. Thanks to Elaine for the foodie Tip! The Biggest Bargains This December in Manila! Those are exceptional photos with a Canon point and shoot! You are good! haha! brings back lawschool memories…i usually ordered the pork schnitzel and 2 tapsilogs…. 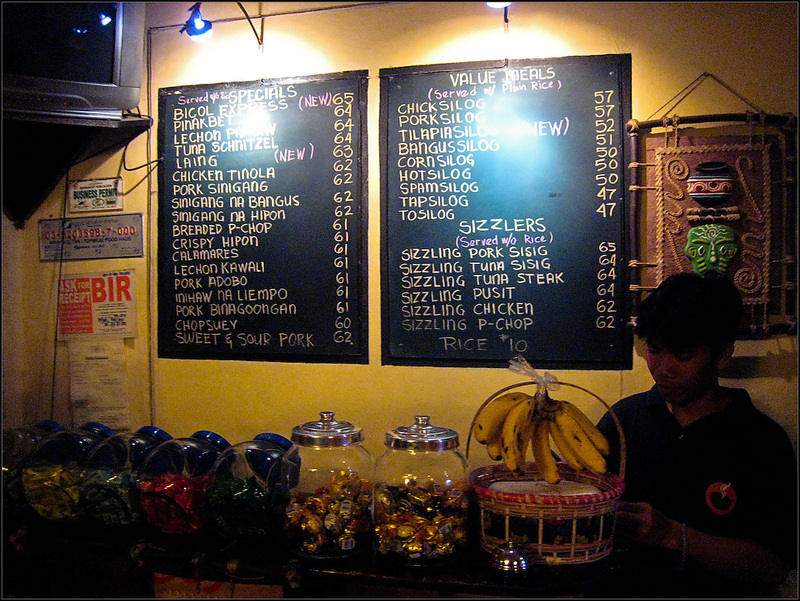 This brings back memories of Garahe and Kaibigan and Henry’s in La Salle Taft. Garahe most especially since I’m a product of Catch 2002. Agno was our tambayan, although they are more of the carenderia types, hehehe. Hey Anton, kindly make the correction on the contact number of Top Meals. It’s 895-1249. I love this place. And right now I crave for Top Meal’s Sizzling Tuna Sisig and Green Mango Shake. Good job Kuya Wilson! Looking forward to visiting this place soon …. A good find this must be. I always thought Top Meal was Lucban cooking. In fact when I went there on May 15, they weren’t there. Lol. its good to see top meal featured here in OAP. i’m from poblacion and top meal is one of the best food haus in the area. Top meal was my home when I was still in makati. This place was my relaxing haven after a stressful work on construction site. Good food and good people…I hope there will already be a future expansion for TopMeal! wow! im so impressed! Top Meal is owned by the family of one of best guy friends- Arnel Chavez! i haven’t visited in a long time since Arnel is working in Qatar na, but i used to go there for free food! haha! They really serve good food! thanks for the new find. will try to visit that if i have the time. good photos also. if you want to really enhance your skills on photography theres a camera club of the philippines at waltermart makati 5th floor. nice mall too. thanks for sharing. i’d be happy to share more of our foodie secrets! comfort food talaga. i wish theyd serve halo halo again. i went to top meal last night. we had binagoongan, bicol express, pinakbet, chicken al mada, sinigang na baboy, and leche flan!